Live digital caricatures are the wave of the future! The drawings are done using the latest technology and can be seen as they are drawn on a laptop screen over the artist’s shoulder or on a big screen TV, making the process visible to the entire room! Digital caricatures can be done in black and white (10-12/hour) or in full color (5-7/hour) using a portable inkjet color printer. The caricatures can be printed on the spot and can be uploaded to the internet for viewing later on a smart phone or computer. Set-up is quick and only requires access to electricity, 2-3 chairs and an 8-foot table–the artist provides everything else! There are only a handful of artists doing this type of caricature nationwide, so if you’re looking for something new and unique to entertain your guests, give digital caricatures a try. Hourly rate is $160/hr and discounted to $145/hr for longer events of five or more hours.. Your guests will love this! 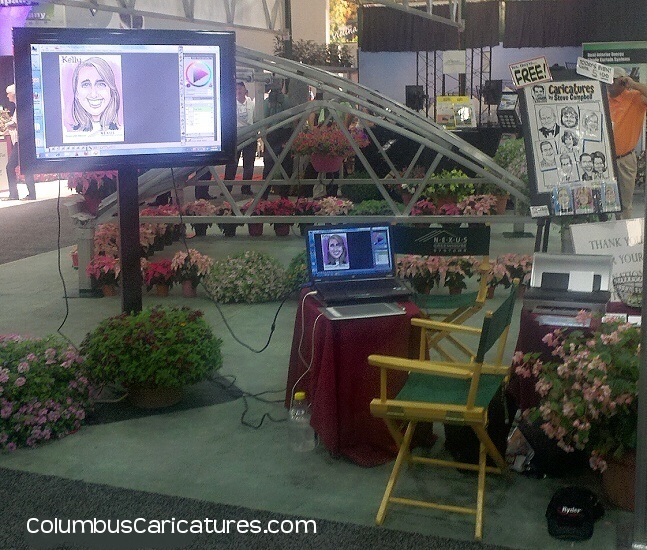 Because seeing someone doing high tech caricatures is so cool, it’s as much fun to watch as it is to be drawn! The drawings can also be easily personalized with a logo, a preprinted body or a special border. But unlike traditional caricatures, these preprints are free because each is printed on the spot, not in advance. Also, plastic sleeves are provided for each drawing for free! NOTE: Because not all of our artists are currently doing digital caricatures, this service is subject to artist availability.